When I started using my new ice cream maker, I pretty much wanted to make every frozen concoction I could imagine all at once. Plain ice cream was quickly followed by ice cream sandwiches with a chocolaty sundae coming right after that. 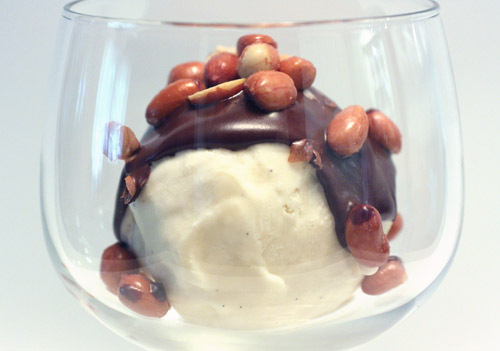 As I read the Demolition Desserts' recipe for vanilla gelato which I used in those ice cream sandwiches, I saw the note at the side of the page: “make a tin roof sundae with dark chocolate sauce (page 207) and salted Spanish peanuts.” Thank you, yes, I believe I will was my response. Throughout this book, there are helpful tips, suggestions, and added information in the sidebars, and I appreciate that each topic is thoroughly covered. For instance, on page 207 with the dark chocolate sauce recipe, there are more notes about how this sauce could be used as a filling for cupcakes, or as a warm sauce served with homemade graham crackers and marshmallows, or as a drizzled sauce over cakes, ice cream sandwiches, or bare skin. I didn’t make that up; it’s part of the list. There’s also a note about making this as milk chocolate sauce rather than dark chocolate. Despite the book’s focus on somewhat complicated, plated desserts, there is a lot to gain from learning the techniques for each component of those desserts. 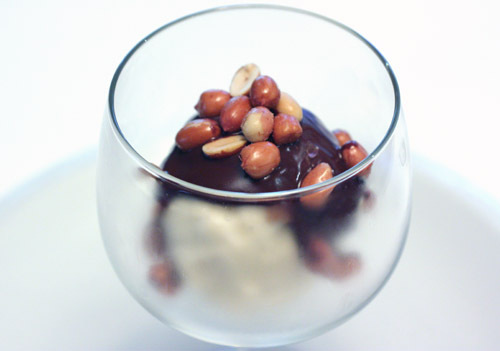 And, rather than preparing the desserts exactly as presented, the components can be used in simpler ways just as this sauce is being used here for a sundae. There are two types of chocolate flavor in this sauce. First, 70% cacao bittersweet chocolate was melted with a combination of heated cream and honey. Then, cocoa powder was heated with water and whisked until thick. The cocoa mixture was added to the chocolate-cream mixture and whisked to combine. Butter and salt were added to finish the sauce. The result was a thick, full-flavored chocolate sauce with a nice shine. It can be refrigerated for a week, but it does harden when chilled. There are instructions for re-heating by placing the bowl of sauce into a larger bowl of warm water, but I found that removing it from the refrigerator about 20 minutes before I plan to use it gave it enough time to soften to a spoonable state. The luscious sauce poured over freshly made vanilla gelato and topped with salty peanuts was a very fine version of this classic sundae. All the contrasts, cold ice cream and warm sauce, oozy sauce and crunchy peanuts, sweet ice cream and salty nuts, make it what it is. One more classic ice cream treat has been re-created at home, and now there are only about a thousand others I’m looking forward to attempting next. You'll have to check out Citizen Cake next time you are in SF. Tin roof sundaes harken to my youth - my dad had a hankering for them that he passed along to us kids. This looks very, very good. I am so loving summer - all this wonderful ice cream! I've been somewhat obsessed with the unusual flavors that everyone has come up with but you've brought us back to the unsung heroes of frozen treats - the toppings! They allow for infinite variety with whatever flavor you may already have. This sauce is heavenly! this is a fun ice cream! I cant get enough ice cream in summer .. yesterday I made apple pie and a dollup of ice cream is what made it heavenly! I always used to get Peanut Buster Parfaits from DQ after swim meets in the summer, so this is right up my alley and 1000x better - yum! As much as I appreciate the healthy diet, I, sometimes....sometimes, would like to just enjoy the food. Having a scoop of ice cream like this belongs to one of those moments. This used to be my favorite sundae when I was a kid, though back then it was called a "Mexican sundae." Not very appropriate name, but it sure was tasty. I've adored Spanish peanuts ever since. Yum. That's why I will not buy an ice cream maker, simply because I would not resist making one every day. Yours is making me drooooool. Peanuts and chocolate is a killer combination. Add ice cream and positively explosive! I would have no willpower in the face of this puppy. 2 kinds of chocolate, gelato, and peanuts! What more could anyone want in a dessert? Yummm! That would be perfect right now. The weather's warm and ice cream with all then chocolate poured on top fits just right!!!! I love this sundae!! Salty peanuts and chocolate makes a great combinations! You and I are definitely on the same wavelength! My brother just asked me to cook a dinner for himself and some friends in September. I was paging through my magazines and stumbled on a sundae much like this one. It's what I have already decided to make for their dessert. Tin Roof is my favorite flavor and I so love what you've done here!!! I think I shall make some of that sauce to have handy when the ice-cream cravings come!!! Thx for popping in!!! Yummy dessert and cute glasses! So delicious! Mmmhh, I love that flavor combo! This dessert is so lovely,.....Fab! You are having a blast with that ice cream maker! This looks amazing! Love the tin roof part...he-he. uh, I love tin roof ice cream. It is always perfect on a summer night. one phase of my life i would buy only tin roof sundaes. but i see now that the home made version looks waaaaaay better than that! Seriously gorgeous looking ice cram. Perfect summer dessert, love the peanuts in there! Peanuts and chocolate remind me of my favorite candy bar as a kid. To put it on top of ice cream just makes it that much better. I know from extensive testing on chocolate pudding this past winter that the chocolate flavor is much amplified by including cocoa powder with the couverture bar chocolate. The honey is a lovely touch as well. This has got to be an amazing hot fudge sauce. Can't wait to try it. Thank you! Oh Lisa, this is a perfect dessert for me. Ruch vabilla, dark chocolate and a little bit of salty crunch. And your photos are perfect as always. I've been thinking about buying an ice-cream maker for a while, but I always thought that it might just be one of those things that will end up cluttering the kitchen and gathering dust. Could this have a cuter name? I think I need this. Not just want - need! MY. FAVORITE. EVER. And that last picture? DROOL. Oh wow, many memories of childhood. My late maternal grandpa used to buy them for me all the time, when I was a little girl, although I didn't like peanuts at that time. I used to whine that it was wrong and I didn't want it. Now I would give anything to have him buy me one again. Love your blog, your culinary creationss and photos are phhenomenal. Hi Lisa, powdered orange peel is such a handy thing to have in the kitchen, it adds such a beautiful smell and oh my, look at this sundae!I am having the most intense Pavlovian reaction to these pictures! 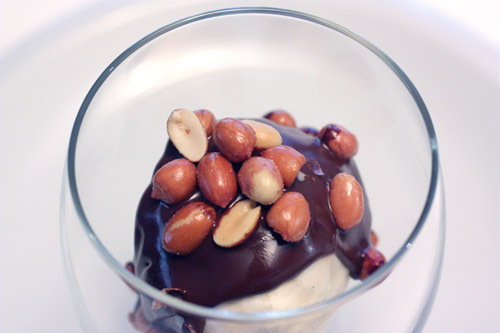 Last night I had a sudden urge to make hazelnut chocolate gelato, now i think I might have to add a one or two spoons of chocolate sauce and some candied hazelnuts- somewhat of a tin roof sundae.